If we were, say, in New York City, there would be a hotdog stand or a food truck serving grilled sausages at almost every street corner. But this is Manila. 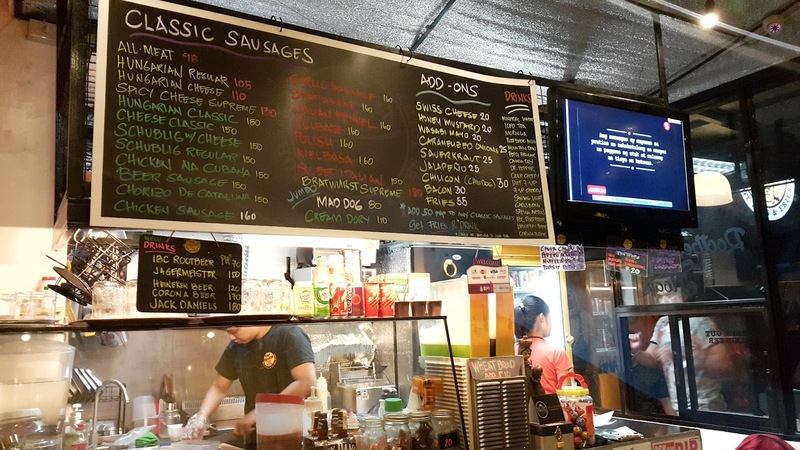 I live in Pasig, specifically, and aside from 7-Eleven and perhaps the ubiquitous Angel's Burger (which, despite their kiosks' questionable sanitary conditions, serves a mean Hungarian sausage sandwich for just a little over P70), there are very few places one can easily get good sausages at for a reasonable price. 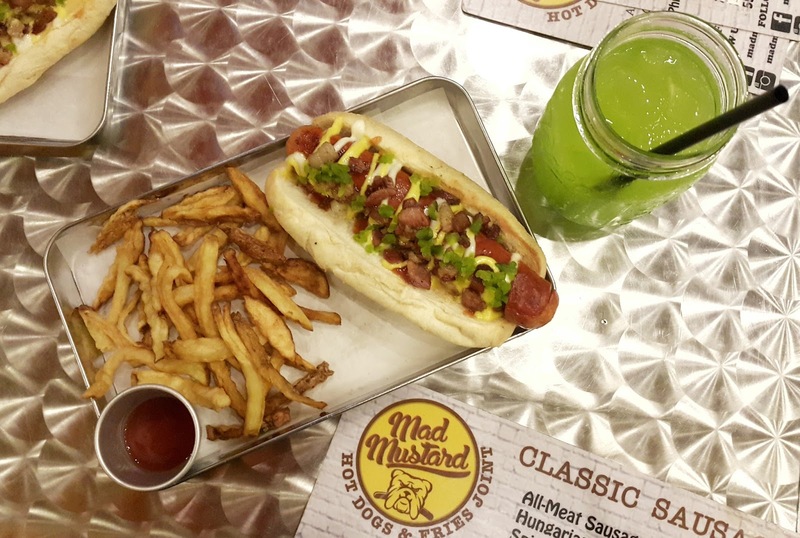 Lucky for Marikeños and those living/working nearby, there's Mad Mustard, a recently-opened hotdogs and fries joint located near what is quickly becoming the next foodie haven, Lilac Street. 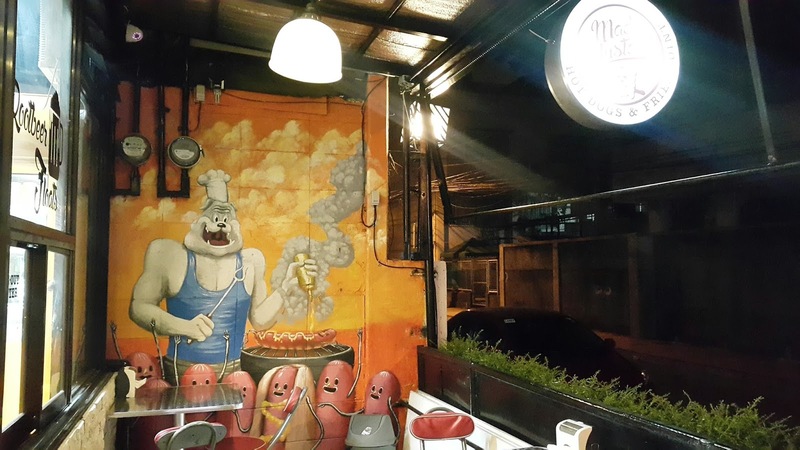 Mad Mustard serves many different kinds of tasty sausages at very affordable prices, from their most basic offering, the All-Meat Sausage (P98) to their most expensive, such as Bratwurst, Kolbaz (or Kolbasz), Kielbasa and Italian Fennel (all P160). They also have other unique sausages like Beer Sausage and Chorizo de Cataluna (both P150). You get your order in a hotdog bun, with a smattering of ketchup, mayo and, naturally, mustard on top, plus a spoonful of pickle relish (they pile 'em all on by default, so tell your waiter if you don't want any). You can customize your sandwich with add-ons such as Swiss cheese, jalapeño, caramelized onions, sauerkraut and bacon (P20 to P30 per add-on). No need to worry about overdoing it because they give you plastic gloves to eat with, in case you make a mess. You can even make your order a combo for an additional P50 and they throw in some crispy fries and a cold drink—your choice of either iced tea or moringa citrus, which is surprisingly good considering it is malunggay (but don't take my word for it; you may ask your waiter for a taste of it in a tiny tea cup first). The place is beautifully painted bright yellow and orange, with sausage cartoons which might make you take pity on your food (not me, I was pretty hungry). If you're with friends and are staying for a while, you can order beer. 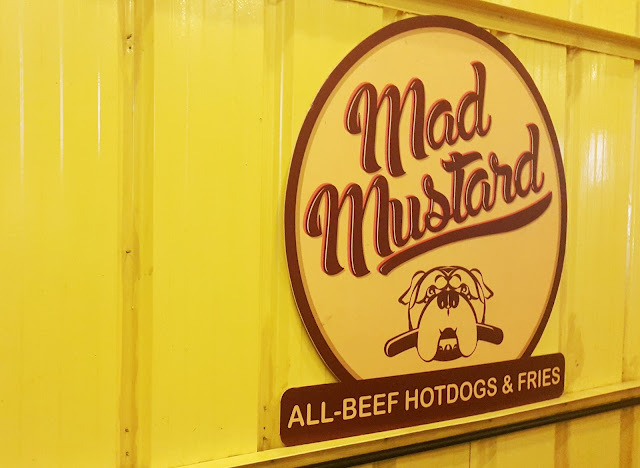 Mad Mustard carries imported brands like Corona and Stella Artois, and they go really well with sausages. Just don't stay too long or be too loud when you get drunk, because the place seats only about 20 persons, inside and out, and the place can get a bit warm especially when packed. 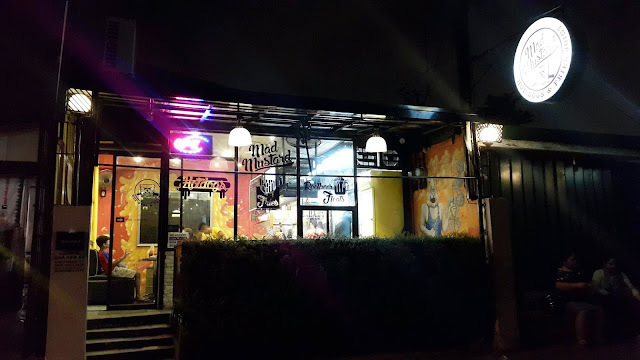 Mad Mustard Hotdogs & Fries Joint is a stone's throw away from the infamous Lilac Street, at 60 Sapphire Street, SSS Village, Concepcion II, Marikina. Despite having been featured on local TV at least once, the place has no long lines outside and almost no reviews on the Internet (though there is a somewhat disturbing-slash-hilarious search result that links to the Urban Dictionary "mad mustard" entry). Go visit while demand hasn't yet made their prices shoot up.